A recent study published in ‘The Spine Journal’ showed that almost 80% of the population between the ages 18 and 44 claim they carry their cell phones for over 90% of their waking day. The stress of constantly looking down at a phone leads to a host of problems stemming from what is described as ‘Text Neck’. Research shows that the average head weighs approximately 4.5 to 5.0 kilograms when resting properly on the neck. Any forward carriage of the neck adds weight to the neck at varying degrees. Every fifteen degrees of forward neck flexion adds between 4.5 and 15 kilograms of pressure onto the spine. The normal forward flexion present when looking down at a phone increases head weight on the neck and spine by 30 kilograms. According to a 2017 study titled ‘Text Neck’ published in the Spine Journal, orthopaedic and spinal specialists have noted a significant rise in the number of patients complaining of neck and upper back pain. Many of these complaints come from children, teenagers and young adults who experience frequent neck pain, shoulder pain, and headaches. Hundreds and thousands of hours spent looking down at electronic devices creates abnormal neck curve alignment, leading to neck strains and possibly disc changes. A study of over 7000 young adults between the ages of 20 and 24 showed persistent neck and upper back pain associated with time spent looking down at mobile devices. Accelerated neck and mid-back spinal degeneration becomes a likely side effect of the forward head flexion often experienced through texting. The increase in disc pressure during the head forward position contributes to spinal dysfunction which results in disc degeneration and poor spinal health. Chiropractic remains one of the most important and effective interventions to minimize and reverse the negative effects of looking down at technology. 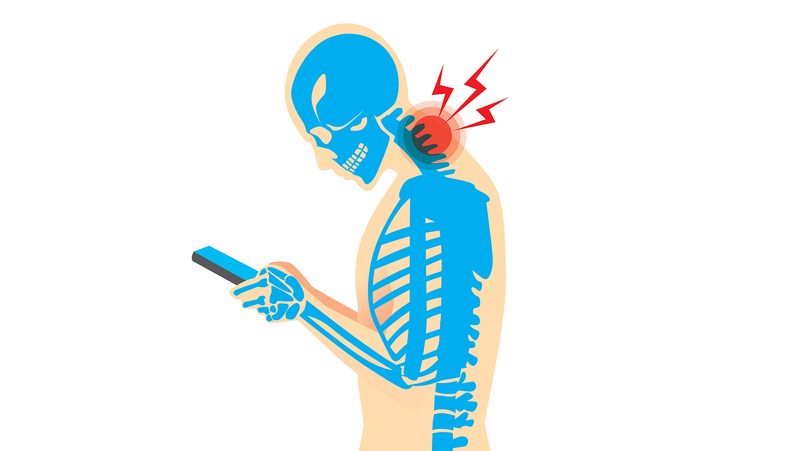 Research clearly proves a connection between text messaging and adverse conditions in the neck and shoulders. Far more extensive research over the last 120 years proves a major connection between overall spinal health and a person’s quality of life. The spine’s intimate relationship with the central nervous system directly links optimal function and well-being to the status of the spine. The nervous system becomes imbalanced whenever spinal position or mobility becomes altered or misaligned. Chiropractors detect and correct spinal misalignments to remove stress from the nervous system and allow the spine and body to function like it should. 1. Hold cell phones (and all electronic devices) at eye level as much as possible. 2. Text with two hands to create more symmetry and minimize spinal imbalances. 3. Take frequent, long breaks from electronic devices throughout the day. 4. 20 second stretch – Pull your arms and shoulders back while tilting your head up to look up at the ceiling or sky. Do the 20-second stretch at least once every hour.